Nokia’s Android rumour is at an all time high that seems almost definite at this point in time. It’s harder than ever to not feel that they are going to announce an Android powered device. 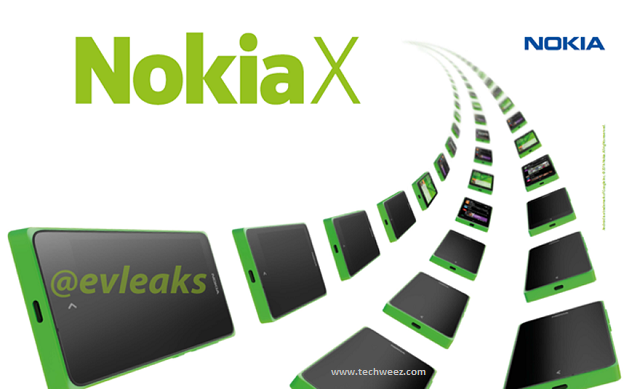 Nokia X codenamed Nokia “Normandy” has had leak after leak with it’s future becoming ever more vivid. Several product photos have come out from several sources, including benchmark screenshots. Now that Nokia will be announcing new devices on the 24th February at Mobile World Congress, we will lay to rest these rumours in a matter of days. This most recent leak from EV Leaks on Twitter shows an image that could be used in a slide at launch, including the Nokia text in blue. What gives it away further is the colour in the text Nokia X which is the same colour of the Android logo. Further on, Nokia recently changed the colour of their Facebook page and Twitter page to the same Android Green. Goes without saying by now. Now Nokia is not going all out with Android, this is just for the entry level devices for the emerging market. The cheap droids have been very serious competition to the Asha range of phones and I assume Nokia wants to bring a good experience to the low end, in a way that feels like Nokia. What we understand is going to happen is that Nokia stripped down Android of Google Services and loaded in Nokia Services. They also added their own UI while at it and brought in some tiles and what seems to be a fastlane simulation. (Fastlane is what you get on the Nokia Asha range where you swipe to reveal a page that has all the notifications in one place). What do you think, something you would buy?